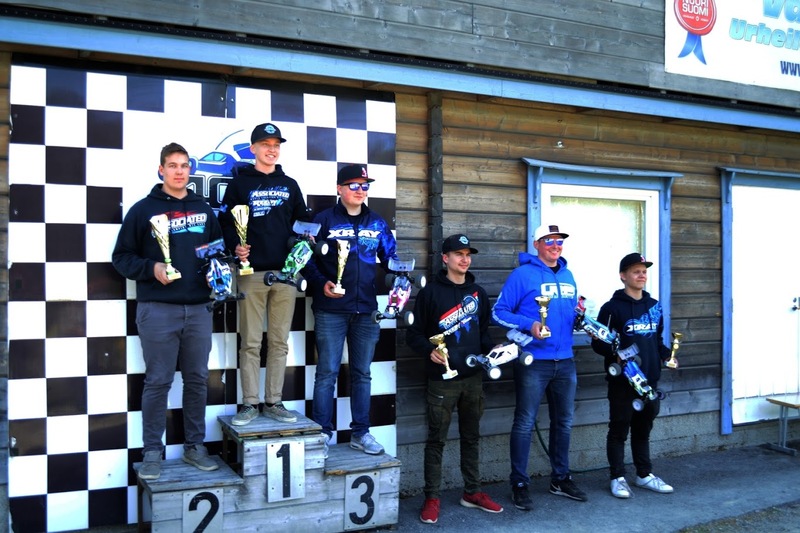 First round of National were held at Vaasa, Finland. Track itself was amazing as always and many people says that it is one of the world best electric offroad tracks. Race organizers did everything top notch like usual at Vaasa. Also weather was awesome whole weekend. We arrived to the track on friday evening to setup the pits and glue couple sets of tires and get cars all dialed for the race. Saturday morning at 8.00 controlled practice started with 2wd, then we had Four rounds of qualifying and triple mains. Joona Haatanen was fast and consistent in 2wd as expected. We had couple close runs in qualifying but I was lacking some consistency and Joona got the TQ spot. Finals were not so good for me even my car was feeling allright. Wind was making big jumps harder and harder. I made too many errors and after 3,3 and 2 finishes I had to settle to 3rd overall. 4wd started sunday morning and my car felt dialed. Lots of traction with awesome smooth power and very easy to jump. I felt that I have a car to win in practice. I was able to TQ Q1, Q2 and Q4. Then to the finals. A1 was pretty easy for me. Joona Haatanen crashed on first lap behind me and I was then able to just pull the gap to others and keep it clean. A2 was super tight battle then Joona tried to pass me and we touch. I ended up flying off the track and recovered to 2nd position. After race I was pretty frustrated of that move but then just keep my focus on winning A3. Joona got pass me early on after I made small bubble. I was pressuring Joona hard and I was able to jump inside him in front table top. Then I just kept it together to the end and won the race! Big thanks to my sponsors for supporting me with awesome equipment! XRAY EuroRC.com Hobbywing Hudy Highest and TShades.